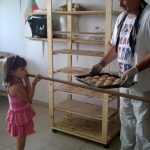 Chitalihste “Vasil Levski 2012” in Pojarevo village revived the cultural and educations activities in the village in 2012. 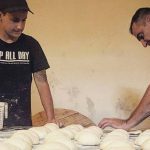 As a result of the qualification training “Bread as a social event” in Sofia, October 09th – 10th, 2017 the following baking events were organized and implemented at Chitalihste “Vasil Levski 2012”, Pojarevo village for multiplication of the “methods for social bread making”. Today, there are functioning: a folklore dance ensemble “Ogin”, an applied arts workshop, traditional Bulgarian costumes workshop, children’ workshop, theater workshop, English language classes, youth, women and pensioners clubs. 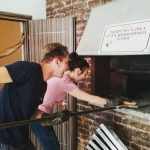 Since mid 2013, the Chitalishte has started the bread making and baking workshops at the newly renovated village wooden oven. 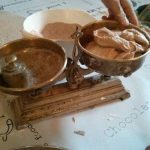 “Pre Christmas Celebration and Meal Therapy” is traditionally organized a month before Christmas holidays. 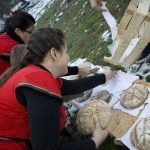 This year it was within the framework of the initiative “methods for social bread making” – the emphasis was on making yeast bread and festive breads. 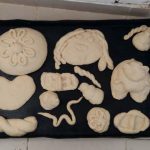 For the children there was a special workshop for making and baking Christmas special breads by their grandmothers. 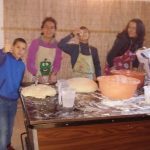 The magical warmth of Christmas was shared in intergenerational environment applying the methods: traditional Bulgarian bread making combined with storytelling of Christmas traditions and customs, Theater of Crumbs and fun culinary. 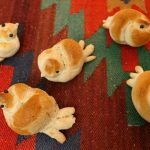 During the bread making stories and memories were shared, wishes were made. More than 10 people took part (elderly ladies and children), November 18th, 2017. 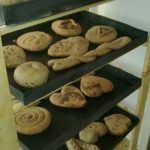 Workshop for yeast bread making following traditional Bulgarian recipe and festive breads was carried out in the presence of 10 guests from Mexico, Australia, New Zealand, the United Kingdom and USA took part on December 17th, 2017. In the process all worked “hand in hand” – one continued the making started by the person next to them, handing it down the line to the other participants. 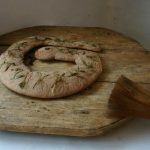 The story of the village was told during the bread making, the types of bread made for special events were presented and all “painted” the tale of the future at the end. 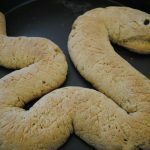 The following methods were applied: Theater of Crumbs and traditional Bulgarian bread making combined with storytelling of Bulgarian traditions and customs. Traditional annual celebration at Pojarevo village on May 24th, 2018. 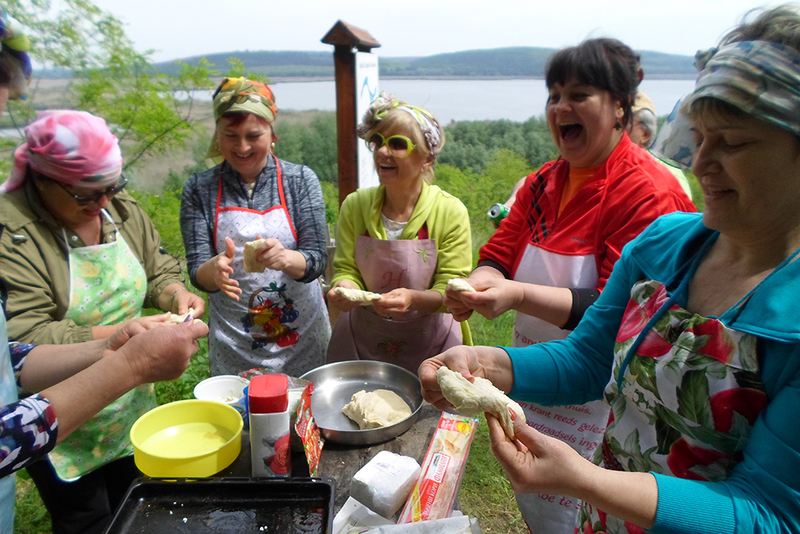 At 9 am, 25 enthusiasts gathered at the Chitalishte to make traditional Bulgarian bread following all the stages. 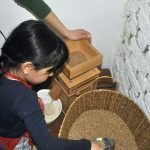 Firstly, they grinded the grains in the portable mill, then enjoyed the making of the bread with their children, partners and friends and at the end baked it in the village wooden oven. 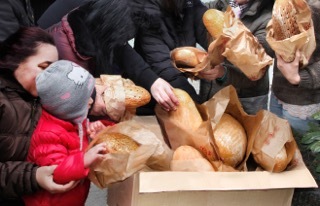 At noon they fed the local people and guests at the square celebration. 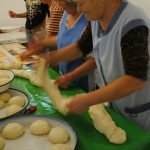 The following methods were applied: community baking, Theater of Crumbs and traditional Bulgarian bread making combined with storytelling of Bulgarian traditions and customs. 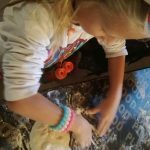 Bread making workshop for children on June 11th, 2018. 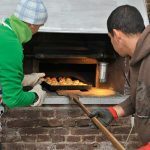 More than 20 students from a Sofia school followed the bread making path from grain grinding, made the dough and baked it in the village oven. The children dreamed, made music, danced and shared stories. 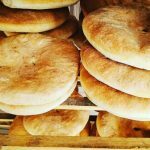 The following methods were applied: Theater of Crumbs, traditional Bulgarian bread making combined with storytelling of Bulgarian traditions and customs, fun culinary and kitchen music.